Brazil's Bee Creek Brewery recently announced they are closing their doors. They will be greatly missed, as we were fans of their beer, holding fond memories of the Clay County Coffee Stout, among others. We hope as this door closes, this won't be the last we hear from them. The second year of the Beer and Cheese Club starts off with a bang. 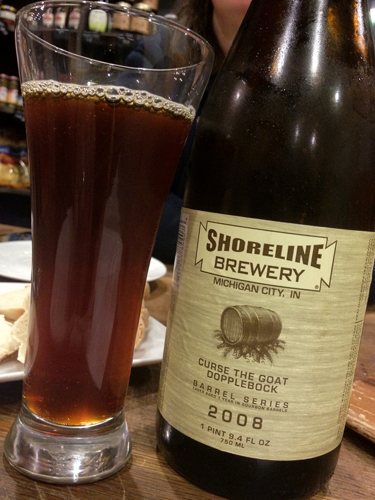 In the beer department, Shoreline's 2008 Curse the Goat barrel-aged doppelbock. 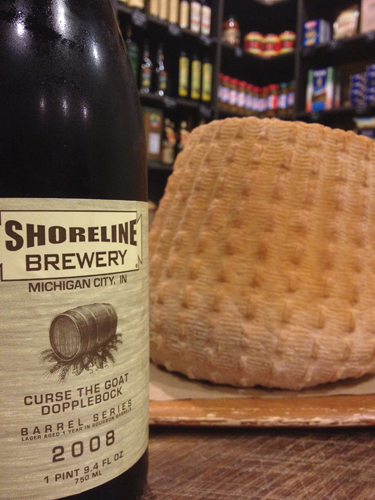 Shoreline's barrel series can typically fetch $20 or more at a liquor store, so for Curse the Goat to show up in an edition of the Beer and Cheese Club is really something special. But it doesn't stop with an impressive beer, oh no. Our cheese selection is crafted by an Italian cheese maker that decided to set up shop in Kentucky. Giovanni Capezzuto's Kentucky Grana gets an even more local twist this month. The Smoking Goose has smoked a wheel of this cheese and it is this month's cheese selection with the Beer and Cheese Club! The beer is from the north, the cheese is from the south and Goose the Market brings it all together with the Smoking Goose and the Beer and Cheese Club. 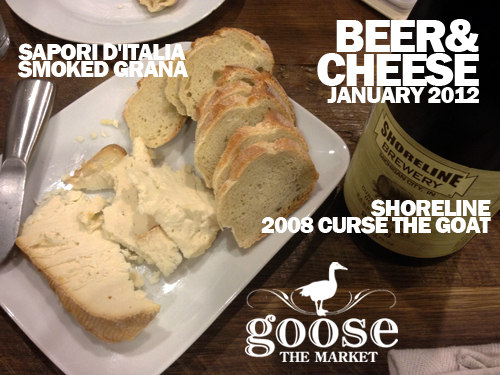 If you're a member of the Beer and Cheese Club at Goose the Market, your January installment is ready for you to pick up right now. If you're not a member, the club is $99 for 4 months. We normally get this out ahead of time, but Winterfest slowed us down this month. Despite our lethargy, I think you'll enjoy the pairing just the same. This month brings an extra special treat to members. The beer is from Indiana’s own Shoreline Brewery and part of their Big Bourbon Series. Curse the Dopplebock is interesting right now. It imparts a bit of sour flavor, mixed with aromas of bourbon and dark fruit. It is light on the tongue and a little warming in the belly. This goat’s milk cheese from Lexington, KY is made by Napoli native, and now Lexington resident, Giovanni Capezzuto. His Old World approach makes for a deliciously subtle and buttery textured cheese. But this particular batch gets a little “Goose” from Chris Eley. This cheese has been smoked at the Smoking Goose, which gives it a little extra something special. If you’ve ever been fortunate to have some bacon or other smoky treat from the Meatery, you know how delicious it is. This cheese takes on that flavor like a champ. I was quite excited about this beer, because everything I've had from the Barrel Series has been great. Curse the Goat took me a little by surprise, perhaps because the barrel aging is beginning to influence the beer in the sour direction. Sour red grapes were the first thing I noticed in the aroma, followed with faint notes of raisin, chocolate, malt and bourbon. The flavor was similar. A bit of tartness mixed with plums, figs and raisins and a hint of bourbon in the background. Certainly no longer your typical doppelbock, this is now something entirely unique. I wouldn't let this beer sit another year or it may lose its body to sourness, but right now the balance is intriguing. 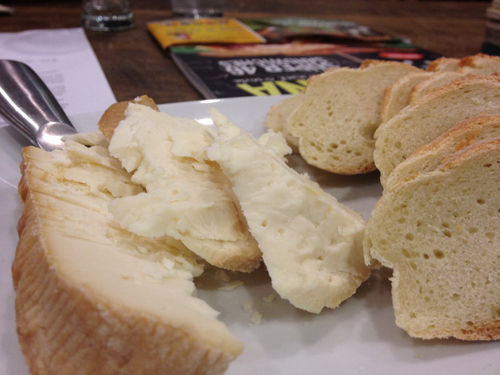 The cheese is another story, as it is quite fresh and bursts with a beautiful smoky flavor. The fresh Smoking Goose treatment is immediately noticeable both in the aroma and flavor. The cheese has a distinct dry, salty, nuttiness that lends itself to smoking and creates an incredible end product. When tasting the cheese and the beer together, the doppelbock notes are incredibly complimentary with the dark fruit and rich malt flavors pairing well with the smoked character of the cheese. The sourness creates an interesting reaction with the salty flavor of the cheese, which seems to run parallel to the other flavor interactions without disturbing them. Certainly a unique pairing! Over the past weekend, visitors coming to Indianapolis for Super Bowl XLVI began hitting the city. Fans from New York, New England, and elsewhere will continue to arrive in Indy this week to cheer on their team on Sunday. But rather than instill rivalry and conflict between Giants and Pats fans, it's our mission at Hoosier Beer Geek to spread the love of craft beer, especially among those visiting Indiana. We know how hard it can be finding good beer in an unfamiliar state. We've covered this one before. Rather than repeat it all, check out our "Where to Drink" guides. In these guides, we cover many local bars, breweries, and brewpubs. We also provide some tips on effectively using public transportation to get to your desired craft beer destinations. All in all, it's going to be busy this week, so a lengthy list of watering holes will be a good thing to have. Hey, we actually have a lot of beer in Indianapolis. Many of the establishments we list in our Where to Drink guides are holding special events and will be open for extended hours this week. If you're interested in visiting an establishment after perusing our Where to Drink guides, check that establishment's website for more details on specials (we link to their websites in the Where to Drink guides). You should also check this blog on Friday morning for our weekly feature, the Random Beer Roundup, which will have the latest news on any Super Bowl-related events featuring craft beer. Our HBG calendar in the sidebar of the blog is also a handy tool. We cannot emphasize this enough: Indiana breweries are making amazing beer. If you know anything at all about Indiana breweries, you're undoubtedly familiar with Indiana's most acclaimed brewery among beer geeks, Three Floyds. Rest assured that if you're looking for Three Floyds beers in Indianapolis, you'll find them at just about every establishment that serves craft beer in this town. But don't fixate on only Three Floyds. While we love their beer, you won't be disappointed with other Indiana-brewed beers. The Indianapolis area alone boasts 16 breweries, with several more opening soon. In short, we have a burgeoning craft beer scene in Indianapolis. We cover most of the breweries in our Where to Drink guides. If you'd just like a simple list of Indianapolis breweries, head over to Indiana Beer. One last warning: At some establishments, you cannot purchase beer/wine/liquor for carry-out on Sunday. This law primarily includes liquor stores and grocery stores. Do NOT forget this or you may end up very upset if you want to have your own stash of beer for your hotel room or tailgate party. Plan ahead and buy before Sunday. Yes it's stupid, but we all have our dumb liquor laws we have to work with. All is not lost, however. Keep in mind that you can still drink at bars, restaurants, and breweries on Sunday. In addition, Indiana breweries and wineries *are* permitted to offer carry-out sales on Sundays, though not all breweries take advantage of this. In closing, we hope you like your stay in Indianapolis. It might be called Naptown, but don't expect to have time for a nap while you're here; there are plenty of things to do in our fair city. Have fun, and enjoy the big game! You can forget all your troubles and forget all your cares and drink downtown. Indianapolis has some great drinking neighborhoods. 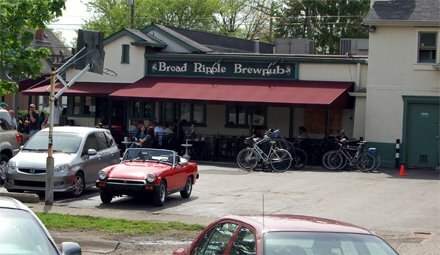 Broad Ripple, Fountain Square, Massachusetts Avenue--they all have great establishments for craft beer. But if you live, work, or visit downtown, there is no need for expensive cab fares or a potential DUI. There are a variety of places within stumbling distance. Here are a few of our favorites in the Mile Square. This Mexican grill has a small craft beer selection, but they make your guacamole tableside (highly recommended), have fantastic tacos, and a fine selection of tequila, if that’s your thing. You might also try a michelada, which is a spicy beer cocktail similar to a Bloody Mary. This counter-service, Texas-style BBQ joint keeps a great craft beer list on tap and in bottles. A nice choice for a quick bite and a drink. I highly recommend the Hoss nachos. If you want to place a bet on most sporting events, you can’t do it in Indy. At least not legally. But if you want to bet on the ponies, Indy can help you. The Winner's Circle is a bar, restaurant, and off-track betting facility. What's more, you’ll find craft beer to help lubricate your wallet. Chef Neal Brown owned and operated the highly-regarded L’explorateur before opening The Libertine, which specializes in craft cocktails and small plates. The Libertine is better known for their cocktails than their craft beer, but we are making a convert out of Neal. A little off the beaten path but close to everything, Pearl Street serves up pizzas, sandwiches, salads, and craft beer. It's a great pick for a meal and a pint if Bankers Life Fieldhouse is your destination for a Pacers game or other event. The two breweries downtown are chains, but they have good food and locally-crafted beers from fantastic brewmasters. The first chain brewery on our list is RAM. We recommend that you grab a pint of RAM’s special or seasonal brews, especially if any barrel-aged brews are on draft. Scotty’s Brewhouse has locations in Indy, Muncie, Lafayette, and Bloomington with a brewery (Thr3e Wise Men) in Broad Ripple. The food menu is extensive and the craft beer tap list is the largest downtown. The patio is a great place to hang and there are plenty of TV’s inside. It is a block from the front door of Bankers Life Fieldhouse. Tavern on South has one of my favorite non-nachos appetizers: Shagbark Teriyaki Duck Wings. The mushroom cappachino soup is wonderful on a cold day. The entire menu is fantastic. It is close to Lucas Oil Stadium. And it has a great tap list. You’ll find me there after work during half priced appetizers (4p-6p Monday through Thursday). If you are looking for a variety of local food bites, you’ll find it at the City Market. Papa Roux and Three Days in Paris (crepes) are among my favorites. But the icing on the cake: the Tomlinson Tap Room. Located on the second floor of the main hall, the TTP serves nothing but Indiana craft beer. And you can get growlers to go (except on Sundays). We just heard from Josh Hambright, brewer at Flat12 Biewerks, who sent us the brewery's taplist for today. According to Josh, Flat12 will not schedule the tappings. Rather, they'll just tap what they feel like drinking at the time. Here's the taplist in no particular order. We hope everyone enjoys the festival today! Super Bowl is here and our 11 day Tent Party that we've dubbed: The Local Underground is in full effect! Our 4,000 square foot temperature controlled structure is hosting the Big Green Bistro with our brand new draft trailer for pouring Fresh•Local•Beer and some of Indy and the surrounding area's best bands! We have created this as a place for locals to enjoy some of the festivities surrounding the big game, as well as an experience where visitors can get a true taste of Indy. The Local Underground is open from 11 a.m.. to 10 p.m. Friday, January 27th through Saturday, February 4th and we'll be serving up Brunch on Sunday January, 29th and February 5th from 11 a.m. to 4 p.m. We'll be pouring Java Mac and plus featuring the Sunny Mary and Pale Mary with Hoosier Mama's Bloody Mary Mix. Come into Broadripple and enjoy all of the Big Game Festivities with Thr3e Wise Men Brewing Company! Stop by and enjoy a beer before you head down the street to watch the concerts and take part in the fun and then grab one to go and take it down the street with you. We will be serving all of our amazing beers plus our current seasonal the Lombardi’s Super Baltic Porter all week long! Triton has 3 specialties on tap currently: Sin Bin Ale, Muletide Raspberry Bourbon Stout and Sweet Georgia Brown. Those will be tapped at Winterfest Saturday. Look for our schedule at the event. It’s almost here: Our Super Bell's Party Wed. Feb. 1st. Party starts at 5pm. Black Note and the firkin will be tapped at 6pm. Live music is at 6 as well. We also will have a small amount of Oracle and 25th Anniversary bottles. Between Winterfest and Sunday's Game these beers will be put on, Stay tuned to our twitter,facebook and BeerMenus to check for updates. Boulder Cold Hop British Style Ale Pint 5.00 6.3%abv. North Coast Pranqster - A big and tasty Belgian Style Golden Ale 12oz 7.5% abv. New Albanian Yakima Red IPA Pint 5.75 7.5% abv. Tuesday Night Trivia will be hosted by Bier Brewery on January 31st with 5 tap handles. Bier Brewery is located on 65th and Binford and produces some "Awesomeness" for everyone to taste! Darren, Jerry, and Corbin will be giving us some of the best product for everyone to see what they have to offer. We have just added a new dart board are with real cork, offical distances, and tournaments. We stay open until 1am for our double dollar menu with all sliders, tacos, toastadas, and snacks at $2 a piece. This week we will be adding a few new beers to our lineup including Sun King Malus Pi, Flat12 walkabout pale ale, Three Floyds Robert the Bruce, and Bier Brewery seasonal brew. Scotty’s Brewhouse Downtown is going to be rocking out for the Big Game! We are celebrating right with a huge heated tent over our patio. We have a whole list of great things going during the week. The Nick & Artie Show will be broadcasting live Monday thru Friday 10am to 1pm next week. We will also have Free Tweetup with Peter King from Sports Illustrated on Tuesday evening at 5:30pm in our tent. Then join us on Friday morning for the live Broadcast of the Smiley Morning Show! We will be opening at 7am for Eggs & Kegs with Smiley! Our full breakfast menu will be available and will be handing out free shirts for the first 50 guest. Scotty’s Brewhouse Bloomington now has Bluegrass Brewing Company’s Bourbon Barrel Stout on tap! You can get this delicious beer every Thursday night for $3.50 a pint! Scotty’s Brewhouse West Lafayette is now pouring People’s Brewing Company’s Mr. Brown on Nitro! Come on by on Wednesday evening and enjoy this awesome Brown for only $9.00 for a 48oz pitcher! Scotty’s Burger Joint in Columbus now has Triton Brewing Company’s Magnificent Amber on tap! Come by on Tuesday and enjoy a 48oz pitcher for only $5.00!! Look what else I just found... it's a map for this year's Winterfest! You'll notice that there are more breweries listed in the previous post than are on this map. I believe the list is more up-to-date than the map, so use the list as a brewery reference and the map as a general sense of layout. 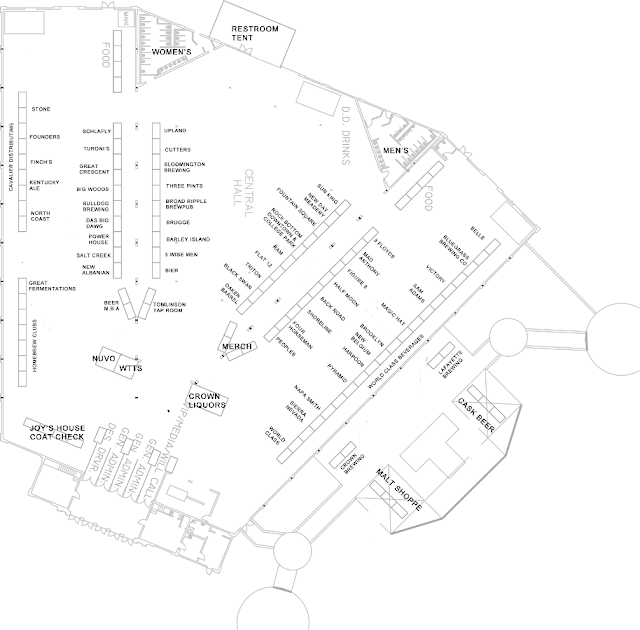 And if your next question is "Will there be a program" the answer is yes and it will include the map. Although I didn't make it so I don't have a copy of it to share with you. Of course if I can dig one up between now and Saturday, you guys will be the first to know. As you may have heard, we aren't organizing Winterfest this year. But that's not to say that we don't still have our connections! The date is drawing close and many of you have been wondering which breweries will be present. The following list may not be 100% complete, but it should be pretty representative of the festival. Enjoy and remember to thank our volunteer crew for their hard work on Saturday! Although I guess it doesn't really matter if you were on the fence about the festival, as tickets have been sold out for weeks. At least now you can be reassured that there will be a ton of great beer! So there you are, shuttled on the IndyGo Green Line from Indianapolis International Airport directly to the doorstep of your downtown hotel and from there into the warm confines of your room. All that travel has you craving a beer. A local beer. But the company you work for is a bunch of cheapskates and you have NO CAR. First things, first: you're in downtown Indianapolis and you're a hop skip and a jump away from a local beer just about anywhere! For tips on where to go, take a look at Hoosier Beer Geek's Guide to Downtown. Within easy walking distance of downtown hotels there are a pair of brewpubs and virtually every bar and restaurant has some craft beer to offer you. But say you've been to Indy before or you're here for Super Bowl XLVI and have already been knocking around downtown for a few days. You're itching for something new.....again, though, you have NO CAR. My friend, you need to get on the bus. For the low, low price of $4, you can buy an all-day pass of unlimited boardings on IndyGo buses to go galavant around the city. For a trip with a plethora of interesting beer stops, we highly recommend the #17 bus. This bus route begins downtown at Ohio St. and Meridian St. and winds along restaurant and bar hotspots such as Mass Ave., College Ave. and Broad Ripple Ave. (click the links for more detailed info about beer destinations on this route). Take a look below for all the information you'll need on your bar-hopping bus trip plus some additional information specific to bus transportation during Super Bowl XLVI. IndyGo runs the buses around Indianapolis. Find info online or in their downtown retail space at 34 N Delaware St (Mon-Fri 8am-6pm, Sat 9am-noon). TIP: IndyGo routes and schedules are accessible through Google Maps directions. To have Google Maps tell you which bus to take, just click the public transportation icon (the one that looks like a bus or train) directly above the boxes where you enter your locations. Route operates between downtown and Glendale Town Center, with stops on Mass Ave, College Ave, and Broad Ripple Ave.
Mass Ave will have FREE shuttle service Feb. 2 - 4 from 11 a.m. - 1 a.m. Shuttle stops can be found on Mass Ave: 300 block near Alabama/Vermont intersection; 600 block near Dean Johnson & 800 block near IPS bus entrance. Additional stops are Indianapolis City Market, Indiana Government Center, Fletcher Place and Fountain Square. Shuttles will run along Mass Ave to the Indianapolis City Market, through Downtown, to Fountain square and back to Mass Ave. Shuttles can accommodate 25 passengers and will have on-board concierges at all times. We'd love to see a bus route like this become permanent (even just Fri/Sat service would be great) but we'll certainly take advantage during the brief time that it's available. Get on board and enjoy all the independent bars and restaurants outside the core of downtown! GOOD LUCK AND HAVE FUN RIDING THE BUS! On January 28, the Brewers of Indiana Guild will stage the fourth annual Winterfest, which will of course feature offerings from Indiana's craft breweries. In honor of Winterfest, we've decided to focus most of our posts this month on Indiana beers. As part of this focus, we thought it would be a good idea to shine the spotlight on Indiana beers that are overlooked or underrated--the unsung heroes of Indiana craft beer, if you will. Admittedly, our methods in picking these beers were not scientific. Indeed, some of the beers that we'll talk about have won awards, so calling these beers "unsung heroes" might be a bit of a stretch. Moreover, our list is going to focus on only one beer from each Indiana brewery we discuss, and we may have omitted breweries who brew beers worthy of unsung hero status. 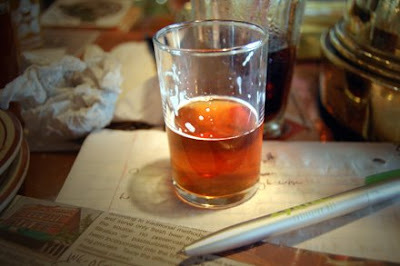 So leave us a comment noting any beer that you think should have been included in the list. In our last installment of this series, we reveal our picks from Indiana's session beers of miscellaneous styles. Brugge Brasserie White. In our opinion, there's nothing quite like a well-crafted Belgian witbier. Brugge Brasserie's White exemplifies the style, with its melding of citrus tartness and coriander spiciness. We wish the brewery would have this beer on more often, particularly during the summer months when the heat calls for a crisp, thirst-quenching beer. Forget Hoegaarden--Hoosiers have Brugge White. "The Tippecanoe Common Ale is LBC's best selling beer, and it's easy to see why. Hints of grapefruit-like hops are nicely balanced with a tasty caramel back, giving you a hoppy yet complex and extremely sessionable red ale. We all liked this one, and luckily it's bottled, so we were able to bring some home." "There is a reason why Tippecanoe Common is so popular: it is delicious. This is one of those beers that is well balanced between hops and malts. But it isn't lacking in Amarillo hops, even in the bottle." New Albanian Community Dark Mild Ale. Not many American breweries are doing an English dark mild ale. Fortunately for Hoosiers, New Albanian is with its medal-winning Community Dark. This is a true session beer, clocking in at 3.7% ABV. What's more, Community Dark does not lack for flavor with its malty chocolate, nut, and molasses notes. Along with Beak's Best, this is one of our go-to beers when we visit the Bank Street Brewhouse. If only NABC sold this beer in bottles.